The St James Theatre presents Gail Louw’s ‘Miss Dietrich Regrets’ as part of their ‘Icons Season’, which runs until 25th January in its studio space. It is a world premiere that is directed by Tony Milner and stars Elizabeth Counsell and Moira Brooker. Another play about Marlene Dietrich. In 1996 Pam Gems wrote ‘Marlene’ depicting the movie star turned cabaret performer in her dressing room before a concert. In 2008 Chris Burgess focused on Marlene’s friendship with Noel Coward in ‘Lunch with Marlene’. Now, with ‘Miss Dietrich Regrets’, Gail Louw looks at the singer’s later years – the ones, in which she was bedridden in Paris until her death in 1992. She could have got out of bed, if she had made the effort, but she chose not to in order to prevent herself from falling down. Her precious legs that made her famous in ‘The Blue Angel’ in Berlin in 1929, had given in. It is the early 1980s, Marlene (Elizabeth Counsell) has made herself comfortable in bed. Yet, independence remains paramount. All she needs is within reach: a cooker, a TV, even a jar to ‘relieve’ herself, but most important her telephone. She cheerfully calls the US President Ronald Reagan to have the high-ranking Nazi Klaus Barbie delivered to France for punishment. She is politically minded and – in her own way – active. But this is only one side. A collection of pills and various empty alcohol bottles that her daughter Maria (Moira Brooker) brings to view from behind the furniture tell a different story. Her aim to preserve her iconic image comes at the price of loneliness, only a selected few are allowed near. And over the phone, many have to accept a ‘Miss Dietrich Regrets’ acted out in a maid’s voice. The play is based on ‘Marlene’, Maria Riva’s biography of her mother, and describes the difficult relationship between them. It is a very intimate relationship and a bit too intimate for Maria’s liking as she is trying to escape Marlene’s clutches. Yet, despite living in New York, she still flies out to Paris – almost at Marlene’s whim – to check on her. There are many unresolved issues that come to light. They include Marlene’s humiliating treatment of Tami, her husband’s lover, who offered Maria the warmth she was missing. Maria’s experience of being abused by one of Marlene’s lesbian friends and simply the different values these two women have. While Maria has yearned all her life for a ‘normal’ life with a traditional family, Marlene doesn’t understand why Maria isn’t grateful for having learned all the tricks of the trade in a film studio instead having had to go to school. With so much information available about Marlene and the immense following she has, any writer has to tread carefully when presenting her in a piece, but the play has been approved by Marlene’s estate. And indeed, Louw’s work portrays the old lady and her daughter rather well. It is nice to see Louw picking up details such as Marlene’s nickname Massie that was used within her family. Marlene’s quirkiness also provides a lot of humour. For example, when Maria suggests listening to some music, the cassette Marlene hands her plays nothing but applause. ’24 curtain calls’, Marlene informs her. Maria reaches for the ‘Stop’ button. There are funny moments in the production, especially for those who are in the know and get the references. Elizabeth Counsell and Moira Brooker also capture the typical mother-daughter relationship with much understanding, for instance, when Marlene changes the subject when she is uncomfortable with it or when Maria explains ‘Yes, I know’ when Marlene tells her a story that she has heard a million times before. Elizabeth Counsell’s portrayal of the aging Marlene is wisely drawn from Maximilian Schell’s 1984 documentary about Marlene, in which she refuses to be on camera. He was just left with her voice, which reveals her temper as well as her vulnerabilities. Counsell’s tone is very convincing and her repeated use of the word ‘Quatsch’ (translates as ‘rubbish’) makes her very authentic. Moira Brooker shows Maria as a very kind and patient person, although there is certainly more to her. Director Tony Milner has created a sound production, which explores the complex relationship of these two challenging characters. However, it’s puzzling why Marlene would wear a glamorous black scarf around her neck and why would she choose to sing ‘Falling in Love Again’ to herself when she hated that song more than any other? Maybe it is a concession to the audience as, after all, that’s the song she is most associated with. Luckily, Marlene also remembers the song ‘The Boys in the Backroom’ with the famous lines “And when I die, don’t pay the preacher / For speaking of my glory and my fame”. It never loses its poignancy as she remains a fascinating and much-talked about woman. 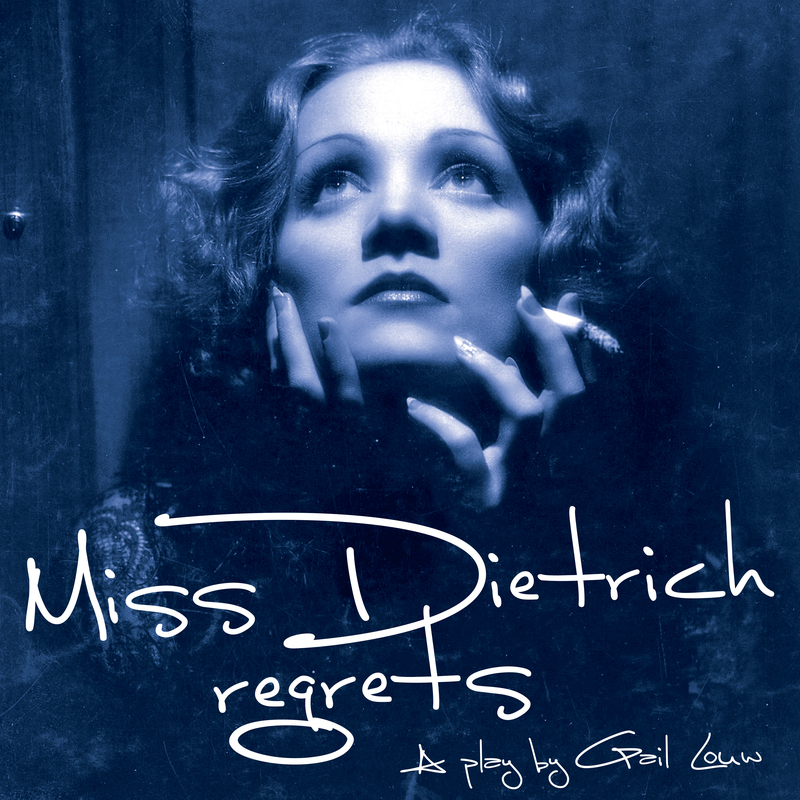 I am sure Miss Dietrich does not regret that. This entry was posted in Uncategorized and tagged Elizabeth Counsell, Gail Louw, Maria Riva, Marlene Dietrich, Miss Dietrich Regrets, Moira Brooker, St James Theatre. Bookmark the permalink.